"Words have consequences. Facebook know this and have acted in other instances where hate speech has polluted their platform. They should act here too." Hate groups, including a movement linked to the Christchurch mosque attacker, are continuing to run ads on Facebook in the UK despite the social media company previously claiming that it was clamping down on hate advertisement on its platform. On Wednesday, Facebook announced changes to its community standards to ban "the support and representation of white nationalism and separatism" across Facebook and Instagram. However, an investigation by JOE has revealed that hate groups were still running Facebook ads in the UK just days ago. 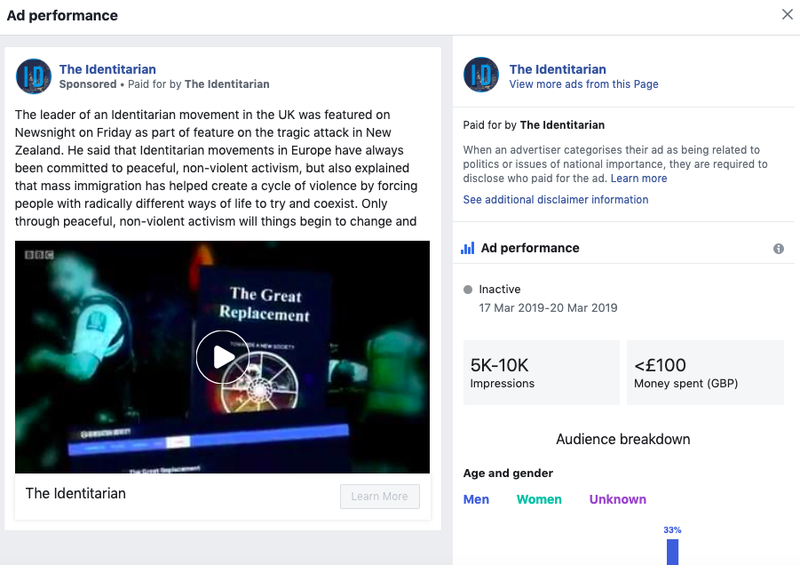 A Facebook page linked to the Identitarian Movement - which was explicitly and implicitly referenced in the 'manifesto' of the man who killed 50 people in mass shootings at mosques in Christchurch, New Zealand - ran ad campaigns in Britain as recently as Monday, 25 March. 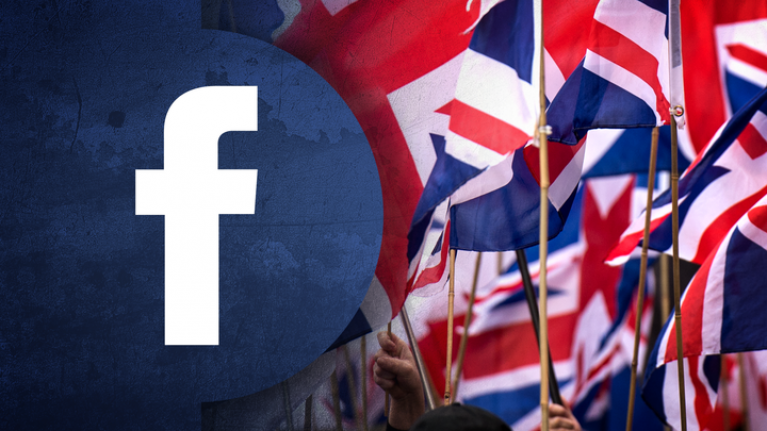 Separately, the far-right group Britain First has also targeted users Facebook ads, despite Facebook saying in March last year that it would be banning the hate group from its platform. A number of ads have been run on 'The Identitarian' Facebook page since the beginning of the year. Between 17-20 March the page responded directly to the New Zealand terror attack, stating that their British leader denied any responsibility for the killing, but claiming that "mass immigration" had "created a cycle of violence" that had led to the mass murder. In February, a promoted post on the platform showed members of the group dressed as 'Arabs', attacking the "Islamisation" of Europe and calling for "an end to religious slaughter". Another ad showed the group staging a mock beheading in Lancashire. 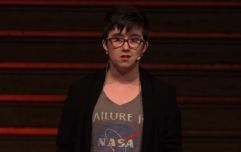 The Facebook revelation comes as Austrian Chancellor Sebastian Kurz on Wednesday morning confirmed a link between the man charged over the 15 March Christchurch attacks and the Identitarian Movement in the country. 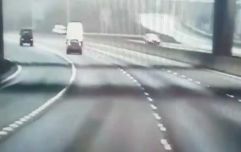 It is claimed the attacker made a donation of 1,500 euros to the group in early 2018. The Identitarian Movement is one of a number of Alt-Right white nationalist groups to have emerged in recent years. It began as a youth movement in France, with its name derived from the French Nouvelle Droite (New Right) Génération Identitaire (Generation Identity), but has expanded across Europe and North America, including into Britain. The defacto leader of the group has previously called on white Europeans to preserve their "ethno cultural identity" and flags for the group have been seen alongside neo-Nazi supporters at far-right demonstrations in London. The leader of Britain First, Paul Golding, paid for a video ad campaign between 1-3 March showing a gang of far-right agitators outside a proposed mosque building site in Maidstone - Facebook had said previously that Britain First would not be allowed to use their platform. In the video the group complain about the "three storey monstrosity" and when challenged by a passerby about their behaviour they reply "What race is Islam?". 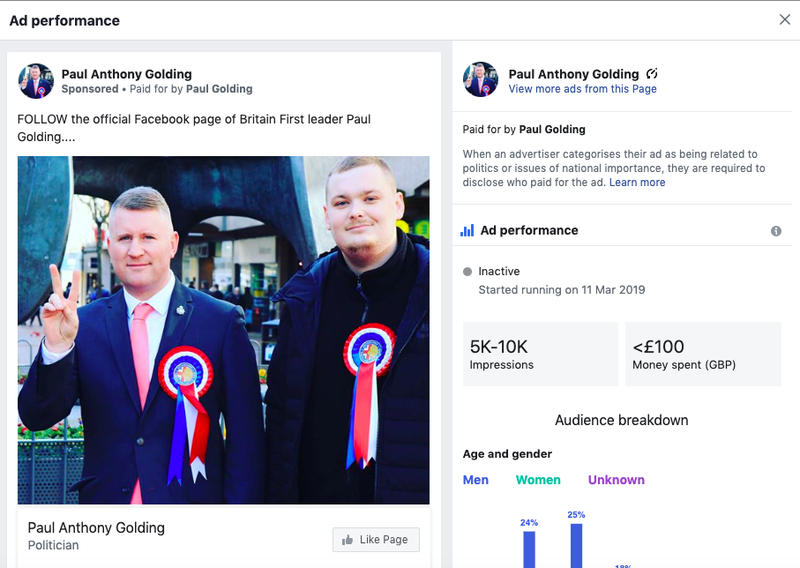 Another ad run on 11 March asked for users to follow Golding's "official Facebook page", alongside a picture of him and another activist. Matthew McGregor, campaigns director of anti-fascist group Hope Not Hate, called on Facebook to act to prevent further hate ads being disseminated via its platform. "It’s hugely disappointing to see hate groups given an open platform on Facebook," he said. "The terrorist who drove into a group of Muslim worshippers at Finsbury Park mosque had devoured material from Britain First, while in the last 24 hours the Austrian authorities have revealed an investigation into the leader of Generation Identity, after he apparently received a four-figure donation from the Christchurch terrorist." He added: "Words have consequences. Facebook know this and have acted in other instances where hate speech has polluted their platform. They should act here too." When contacted by JOE, Facebook said it was "investigating" the pages running the ads in question following the announcement that the Mark Zuckerberg-owned site was banning white supremacist content. UPDATE: Following the publication of this piece, Facebook has now confirmed that these pages and ads have been removed from their website for “violating their policies”.